Ronald Reagan once said "We can't help everyone, but everyone can help someone." Our Annual "Back to School Picnic" was held at Orchard Beach in the Bronx. This is always an exciting progam that helps over 120 students to begin a new school year. Macy's was the Food Sponsor for the picnic which was presented by Consolidated Carpet and Innovative Communications Concepts. Inc. Once again Deb van der Heyden, one of our past August Tea Honorees, generously donated the supplies that filled backpacks for the students. 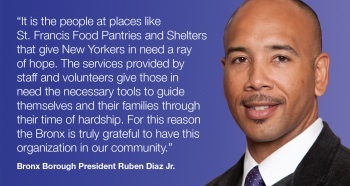 Bronx Borough President Ruben Diaz, Jr. surprised everyone when he stopped by to visit and spend time with the guests. The students were joined by their grandparents and enjoyed a wonderful barbecue lunch, games, dancing and a beautiful time together. Our "Peanut Butter and Jelly Sandwich Making Days" are a very popular way corporations can have their employees directly help St. Francis Food Pantries and Shelters. Gensler and JP Morgan Chase & Co. each hosted one of these projects with their teams of volunteers making sandwiches to help feed the hungry. Collectively these "Sandwich Days" had over 100 volunteers and yielded over 2,500 sandwiches. Our newest Community Program, a "Caribbean Luncheon" was held in memory of Chris Phillips, the late son of Jim Phillips, Founder of TPG Architecture and the host of our Annual "Golf for Hunger" event. 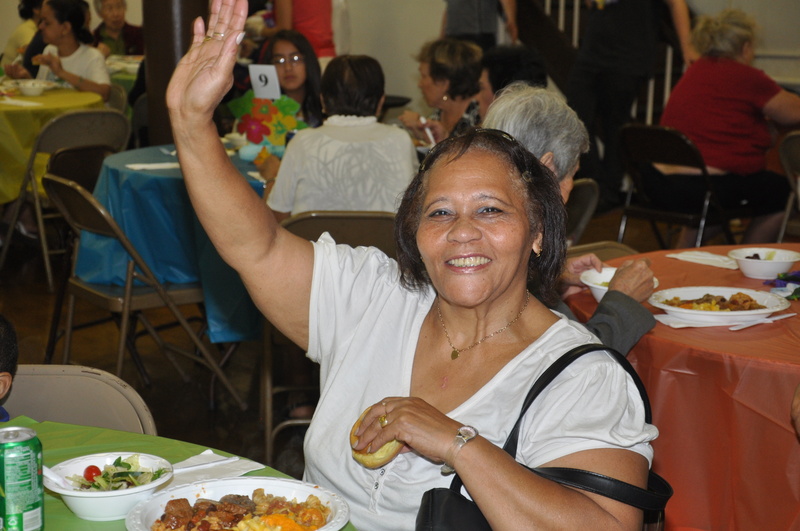 Over 250 clients from a food pantry we help attended this delicious meal. TPG volunteers served the clients "waiter style" and provided face painting and balloon sculpting for the children. Everyone enjoyed this tropical afternoon and special time together. CIT Insurance Services held their Third Annual "Diaper Drive for St. Francis Food Pantries and Shelters". Amanda Reno and 10 other employees head their Community Involvement Team and look forward to organizing this very special Drive for us each year. Amanda stated "This is one of our favorite Drives because everyone loves babies, and it's such a fun way to give". Ross Stores clothing, home goods, toys and baby items continued to be donated and delivered to the locations we help support. The generosity of this company truly shows their commitment to partner with St. Francis Food Pantries and Shelters and help the less fortunate in the New York area. A group of senior citizens we help in the Bronx were treated to a performance of "The Trip to Bountiful" on Broadway through a generous donation we received. "Stocking the Shelves" continues to supply food and groceries to over 40 food pantries, soup kitchens, safe havens and shelters in our network. Each of these feeding programs continue to see weekly increases in the number of people turning to them for help. Our food deliveries help them keep up with these demands. Autumn is upon us and the chill is in the air. We are so grateful to generous folks who realize that a full stomach and warm clothing goes a long way in helping those less fortunate who depend upon us.